This month, we are asking you to think about data-driven decisions. Data gives us the hard facts, the real deal, the black and white of the situation. Data driven ideas are smart for business because they take the emotion out of the equation. With the facts in front of you, or more importantly in front of your patients, you can then help them to understand, in black and white, why we do what we do. When looking for a way to convince your patients of the care they need, or the progress they have made, turn to technology to reveal, with factual data, where they are, what progress they have made, and where they will end up. In 2014, we ran an article, “Video Analysis” by Hoke, Altman, Volkringer and Johnson.1 These physical therapists came together to break down ACL risk evaluation, throwing analysis, gait observations and golf swings. The team of four did an amazing job, and for the tech on your team, this is a great article to review. However, while this team talked about technology then, technology has come a long way in four years, and is even easier today. Perhaps you are not an expert at Dartfish or do not have a camcorder and motion sensors in your office, this is okay. Chances are good that your patient will have a smartphone on them. Using their phone, so as not to break any HIPAA protocol, you can collect physical therapy related data on what is not working correctly today, review and compare video during the time of progress notes and review again and compare at discharge. No longer do you need to spend time explaining knee valgus to a basketball player landing a jump or a UPS driver that continually hops our of her truck, they can see it in real time. The iPhone has a fantastic camera. Chances are many of your patients are very familiar with the camera function, no matter their age. When going through the initial evaluation or first visit with a patient who is having pain brought on by poor biomechanics, use their phone to give them tangible data for what is going on. Not only will they be able to see the issue in your office, but they will be able to go back and study the video using mental practice to get better faster. Slow motion on the iPhone can be taken with the 7, 8, 8 Plus, and X. Simply open the camera app, choose “slo-mo” from the selections and record.2 A word of advice from How-To Geek is that the iPhone does not have a lot of storage and slo-mo videos take up a lot of space, so be sure to be ready to record when you start the video. If your patient does not have an iPhone there are still ways to get slow motion physical therapy videos. Now, you may have to talk them into downloading an app but it is for their health and they can then use this fun feature to take slow motion videos of babies, dogs, cyclists and whatever other fun things they are into. 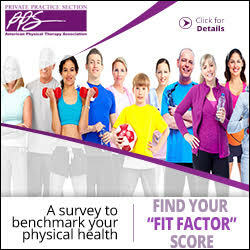 Whether you are looking at a dancer who is having trouble with landing a jump on a raked stage or you are working with a patient with knee pain negotiating stairs, slow motion video for physical therapy offers great data. First, you and your patient can look from the same angle, talking about the same movements and pointing out the same moments of pain. Second, you have a record of where the patient was when they first came in the door, which is great for when they are better in terms of proving results and increasing patient satisfaction. Third, you have engaged the patient in a new way that shows you are really focused, like a camera lens, on them. “Data” are the facts that you use for reasoning and analysis. Thanks to the amazing technology that every patient is walking into your office with, there is no reason to not use their phones to gather great physical therapy data. Not only will you be able to make more informed decisions, but planning for care becomes so much more clear when you, and your patient, can see exactly what is going on. 1 http://www.ppsimpact.org/video-analysis/ Accessed October 2018. 2 https://www.howtogeek.com/346233/how-to-record-and-edit-slow-motion-videos-on-your-iphone/ Accessed October 2018. 3 https://www.geekdashboard.com/create-slow-motion-videos-in-iphone-and-ipad/ Accessed October 2018. 4 https://itunes.apple.com/us/app/speedpro-slow-speed-video-edit/id939421784?mt=8 Accessed October 2018. 5 https://play.google.com/store/apps/details?id=com.mobile.bizo.slowmotion&hl=en_US Accessed October 2018. Katharine M. Schmitt, PT, DPT, is a recent graduate physical therapist from Columbia University Medical Center. She can be reached at kms2282@cumc.columbia.edu.